As a non-tropical, upper-level low spins across the state, showers and storms hold steady in the South Florida weather pattern early Wednesday. This should spell chances for showers and storms nearly each day for the remainder of the work week, leading into the weekend. 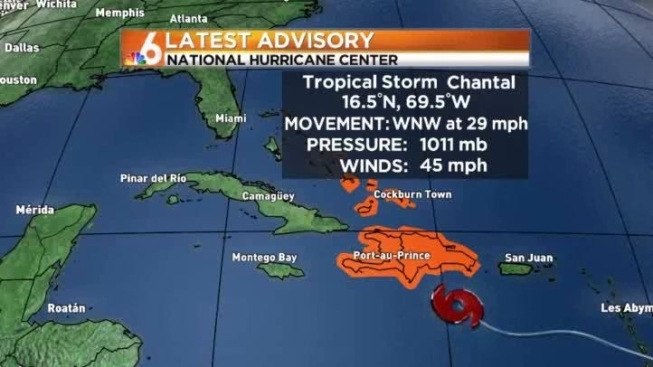 In a weakened state, Tropical Storm Chantal will move swiftly towards Haiti and Cuba and past Hispaniola late Wednesday afternoon. Though South Florida remains in the long-range cone, there is a great amount of uncertainty if there will be any impact to our local weather by the weekend. Wednesday will be partly sunny, with scattered showers and thunderstorms and highs around 88. It will stay partly cloudy with a few showers Wednesday night. Thursday will be mostly cloudy with scattered showers and thunderstorms and highs again around 88.